Kalsa District of Palermo - See Palermo and Western Sicily. It's a city within a city. Often overlooked by visitors, Palermo's Kalsa district is an unpolished gem built upon more medieval history than entire Old World cities. Constructed beginning in the ninth century, it was one of the first planned Arab localities to be established in Europe. The name Kalsa comes to us from al Khalesa (or halesa), the district's Arabic name, meaning "the chosen." This was the administrative centre of the city of Bal'harm (Palermo) conquered by the Normans during a battle early in 1072. The other district, al Kasr (today the Cassaro), took its name from the castle that stood there, though there were several fortified buildings in al Khalesa too. In ancient times, much of what would later became al Khalesa was underwater. Stories abound of Hamilcar and Hannibal docking their ships at the Cala (Kala) bay, the ancient city's port, in preparation for attacks on the Greek city of Himera (near Termini Imerese) eastward along the coast. The walls of the Phoenicians' and Carthaginians' older Punic city extended to what was once the confluence of the Papyrus and Kemonia rivers where the Kalsa district begins (today roughly the intersection of Via Roma and Via Vittorio Emanuele). The centre of Khalesa was located near what is now Piazza Kalsa, though much of the square's present "Arabesque" ambience, such as the "Greek Gate," is due to sixteenth-century revival movements based on Spanish Moorish themes rather than anything we can trace directly to the emirate of Bal'harm. Nevertheless, Khalesa was known for its narrow, winding streets, and some of the existing ones clearly follow eleventh-century patterns. This is one of the features that gives much of Old Palermo its distinctly Arab atmosphere, though this has to do with much more than architecture. The streets themselves may have changed with the passing centuries, but Abdullah al Idrisi knew this district well, and so did Frederick II and his grandfather, the Norman king Roger II. There remain a few features which they might even recognise were they among us today. Khalesa was actually the port area of Palermo, and while little remains of its thirteenth-century coastal fortress (Castello al Mare). Like other parts of Palermo, the Kalsa has its share of Baroque churches and baronial palaces (though a number of the latter were destroyed during the bombings of 1943), but it's also a medievalist's dream, where a two-light window peeks out from the wall of a seemingly modern building along Via Alloro or Via Merlo. The Palermitans themselves have rediscovered it, and the Kalsa is now host to an annual summer festival which finds some of its historic streets illuminated with artistic light shows, closed to all but pedestrian traffic until midnight for about eight warm weeks of each year. Parts of the Kalsa quarter may look rough, with an unkempt chaos, stray (but friendly) dogs wandering the squares and children playing football in the streets, but while prudence is advised after dark street crime here rarely exceeds anything more than an occasional purse snatching. Revitalisation is a slow process. The Kalsa was abandoned for decades following the Second World War, and while it won't win any awards for spotlessly clean streets or silent, decorous residents, it is worth visiting. The atmosphere here is still a little Arab, and even some of the local cuisine originated on the Mediterranean's African coast. One could easily spend an entire day in the Kalsa, and in the evening there are dozens of restaurants and wine bars to experience. If you mention "la Kalsa" to a local resident, the reaction may be that only the small neighbourhood around Piazza Kalsa is what is intended, but al Khalesa included the entire area indicated on our simplified map (below). Though it is (slowly) evolving into a trendy historical district, for now the Kalsa is still slightly "populist" in ambience --and this may seem odd to those expecting a modern Italian neighbourhood rather than a medieval Arab one. Entire families barely speak standard Italian, preferring instead the throaty dialect of the Sicilian language spoken in parts of Palermo. Young teenagers who should be in school can be seen wandering the streets mid-morning, the atmosphere is noisy and certain streets and squares leave something to be desired in terms of tidiness. As they have come to survive to the present day, the oldest medieval historical districts of Marsala, Mazara, Erice and Agrigento (the Arabs' Girgenti) seem essentially Arab with Norman touches, but the Khalsa is, in a way, the largest historically "Saracen" district in Sicily, a faintly Moorish "city." 1 Magione: Built late in the twelfth century in the Norman-Arab style, with sweeping pointed arches, this church seems more Norman, and boasts a splendid little cloister. The monastery belonged to the Cistercians, then the Teutonic knights. It is located at the end of Via Magione, the apse facing the large square of the same name. Next to the apse, at Via Teatro Garibaldi 27, is the entrance to the cloister and museum. 2 Spasimo: Santa Maria dello Spasimo (interior shown above right) was built as the church of a monastic hospice in the early 1500s though it looks very medieval. The cloisters and other buildings were finished but the church itself was never actually completed. Still roofless, it is used for concerts in warmer months. Its style echoes the Gothic but is essentially Romanesque, featuring heavy supporting columns and solid walls bearing rather small windows. The true Gothic never gained much favour in Sicily. 3 Arab Gate: Built over a thousand years ago, this is said to be a gate through which the Norman knights fought their way into the city. It's visible through a window of the Oratorio dei Bianchi at the corner of Via dello Spasimo and Vicolo della Salvezza. 4 Palazzo Abatellis: Built very late in the 1400s as the residence of a noble family, it houses a regional art gallery. The architectural style, Catalonian Gothic, was influenced by buildings erected in Spain during this period (note the faintly Moorish windows). The embattled tower was not merely decorative but functional. With the near-contemporary Palazzo Pietratagliata (in Via Bandiera off Via Roma), this was one of Palermo's last fortified dwellings, offering its aristocratic owners protection from occasional riots. Located in Via Alloro next to the Gancia (15) at the corner of Vicolo della Salvezza. 5 Greek Gate: Porta dei Greci to the Italians (shown at top left). This entry into the city was built in the 1500s with later additions, probably replacing an older gate a block west at Via Alloro. A more recent gate is Porta Felice at the end of Via Vittorio Emanuele. 6, 7 Aragonese Wall: The Aragonese began construction, which was completed in the 1500s under Spanish administration. The top of the segment known as the Mura delle Cattive (6) is a walk open to the public. When it was built, beginning in the 1400s, the wall bordered the coastline, which in subsequent centuries gradually receded about fifty metres. Until 1948 the shore ran along what is today the middle of the street (now the busy Foro Umberto I); the grassy park across the street was built upon the debris of buildings reduced to rubble during the Allied bombings of 1943. 8 Steri: Built for a noble family, the Chiaramonte, in the early 1300s, this urban castle later became the Sicilian seat of the Inquisition, complete with torture chambers. In the Aragonese kings' absence during the 14th century, the Chiaramonte controlled vast tracts of Sicily. To compete with the Chiaramonte, the wealthy La Grua family built Palazzo Sclafani (on Piazza Vittoria across from the Roman ruins , and for a time these were the two highest private residences in Palermo. 9 St. Ann's Convent: This complex begun in the thirteenth century is now home to the local modern art gallery. It's across from Palazzo Gangi, reached from Via Roma by Discesa dei Giudici. 10 St Francis of Assisi: A mid-thirteenth century church in the Italianate Romanesque Gothic style, complete with monastic cloister. Several churches in this style survive in Palermo (Sant'Agostino comes to mind), but this is the only one preserved in something resembling its original condition. 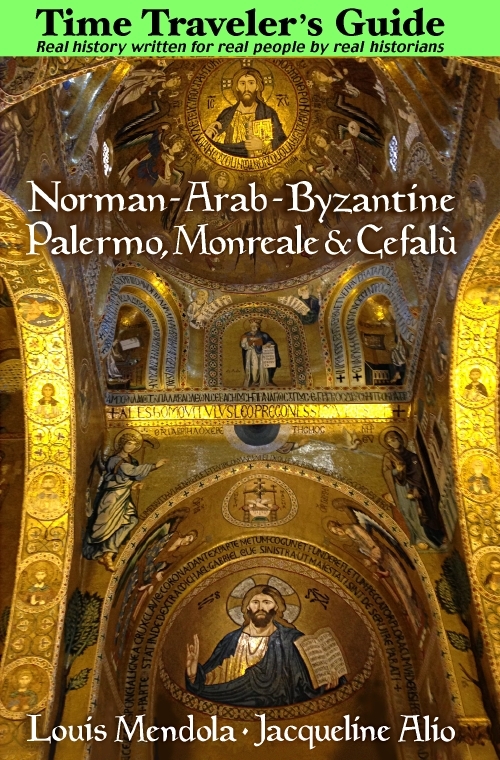 Inside is the chapel of the Grimaldis (today best-known as the ruling family of Monaco), several tombs of medieval aristocrats and some sculptures by Serpotta. 11 Saint Mary of the Chain: Built in the so-called Renaissance Gothic style in the late 1400s. Its name comes from the chain anchored here and strung across the nearby Cala harbor to restrict access. Now the harbor is a port for sail boats and fishing craft. 12,13 Villa Giulia and Botanical Gardens: Like Villa a Mare across the street (Foro Umberto I), a welcome respite from a concrete and stone urban jungle. In the gardens there's a piece of a medieval church. 14 Castle Gatehouse: Frederick II ordered construction of this coastal castle on an older Arab site in the 1200s, and it was not unlike those at Catania and Bari. Little remains but the gatehouse, part of a tower, moat and other fragments. (Most of the superstructure was destroyed by riots during the 1860s by Palermitans who wanted stone to build their houses.) Across the street, near the Church of St George of the Genoans, is the site of one of the old Arab slave districts, foundations and walls entirely below ground level. 15 Gancia: Franciscan monastery built in Italy's distinctive Romanesque Gothic style in the 1300s and later expanded. Its interior has been extensively redesigned and, unlike St Francis, is essentially Baroque. Part of the monastery is now the provincial Archive of State.